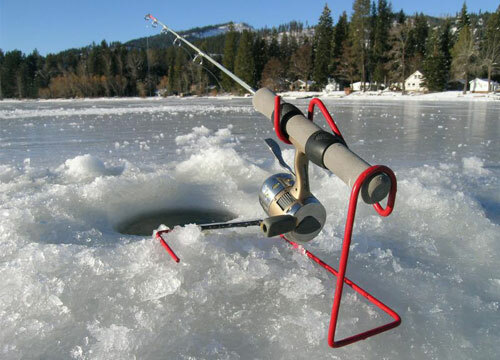 The snow is already flying here, and that can only mean one thing: Ice fishing season is just around the corner! With more than 180 stocked lakes in south central Alaska, the odds of catching a “hard water” fish — whether you are first or 101st — are outstanding. Read on for our roundup of the Last Frontier’s most productive lakes — fishing holes popular with locals and visitors alike. In Alaska’s interior, temperatures drop dramatically in late October. But you won’t notice the cold when you’re pulling champion rainbow trout from the water. Ice fishing season starts here in late November and is best through mid-January. The fish in this 800-acre lake — including arctic char, Coho salmon, rainbow trout and Chinook salmon — always seem to be biting, making this a great spot for novice ice fishers. There are privately owned hard-sided ice fishing huts surrounding Birch Lake, evidence of its popularity with area anglers. Look for the clusters of huts. That is a surefire sign of the best fishing holes. Get in on the action by renting one of the four ice huts or the single lakeside cabin, all available through the Alaska Department of Natural Resources. Quartz Lake is a two-hour drive farther down the road from Fairbanks. Searching for trophy-sized rainbow trout, anglers here typically bait their hooks with fresh cocktail shrimp. Rainbow trout, Arctic char, Coho salmon, and Chinook salmon all live in this water, where the trout and char, usually, measure between 10 and 18 inches. As at Birch Lake, there are ice fishing huts available for rent through the Alaska DNR. Billing itself the “Stillwater Fishing Capital of Alaska,” the Matanuska-Susitna Valley is home to an abundance of roadside lakes that entice the winter angler. More than 80 lakes in the region are annually stocked with landlocked salmon, Arctic grayling, Arctic char and rainbow trout. Also known by its former name Kepler-Bradley, this is a popular state park that draws ice fishers to several lakes stocked with trout and Arctic grayling. Open year round, the park is a convenient drive from Anchorage, lying just north of the Glenn Highway at milepost 36. The parking lot isn’t accessible in winter; look for six parking spots outside the park entrance gate. Many ice fishers target the northern pike, an invasive species known for its monstrous appetite. Nancy Lake, set in a broad valley and ringed with forest, provides a beautiful winter wonderland where you can try your luck. Pike are effortlessly caught and respond well to decoys, shiny jigs and lures. If you’re using bait (check regulations before you go), try chunks of herring or whole sardines. Nancy Lake is a ninety-minute drive north of Anchorage along the Parks Highway. Still haven’t caught your fill of pike? The town of Houston hosts the Mat-Su Valley Pike Derby each weekend in March. This fun, community event awards prizes for the most fish caught, along with recognition for both the biggest and the smallest individual fish. The largest pike measure almost four feet in length. Anchorage boasts a dozen area lakes stocked with Chinook salmon for the winter ice fishing season. There will still be plenty of rainbow trout, Arctic grayling, Arctic char, and lake trout that survive the summer season and are waiting to nibble a morsel of shrimp, canned clams, corn or salmon eggs on the end of your fishing line. Early each February, parents and kids turnout for the Jewel Lake Ice Fishing Jamboree in the southwest part of the city. Organizers provide pre-drilled holes, bait, poles and even hot chocolate and snacks. Now in its 26th year, the event offers prizes for everything from the biggest fish to the oddest fish. Don’t let colder temperatures keep you on the couch this winter when you could be walking on water in the Last Frontier. Whether you’re an experienced angler or curious newcomer, Alaska’s abundance of stocked roadside lakes — and helpful resources from its department of fish and game — make ice fishing the “bucket list” experience of a lifetime.